Forays of a Finance Foodie: Let's Get Naked...Pizza! When it comes to pizza chains today, the word “naked” never really comes to mind for multiple reasons. Not only do I rarely associate the bedroom with the dining room– you may leave both feeling satisfied, but only one leaves you with a greasy cheese burns on the roof of your mouth, unless you’re into that sort of thing – but fast-food pizza is now about the bigger, the bolder, the “badder” for you versus the basics. 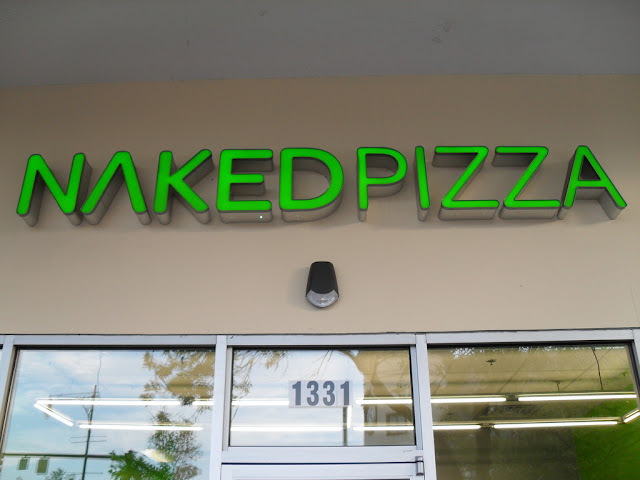 It’s obvious that the people behind the newly opened pizza chain in Coolidge Corner know what they’re doing marketing-wise with a sensory-grabbing name like Naked Pizza, but after eating their not-so-sinful and satisfying pies, it’s also obvious they know what they’re doing in the kitchen. Things move fast at Naked Pizza, and Peter and his staff pride themselves on delivering a healthy – and healthy doesn’t have to mean diet food – comforting, crave-worthy pizza in record time. 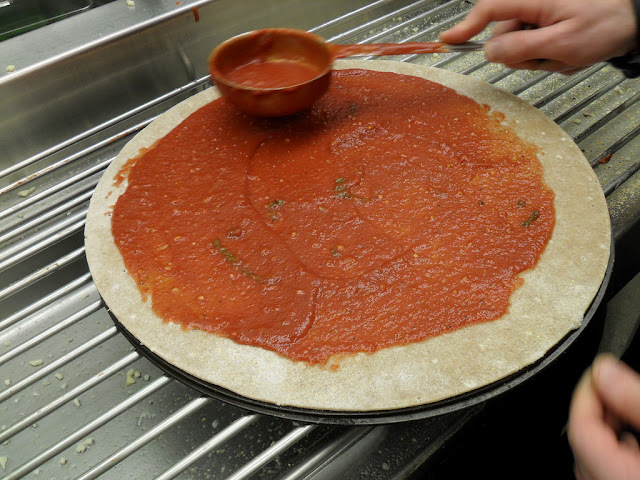 The night I visited, Naked Pizza’s official iPhone app launched, making it even easier for patrons to order a non-processed pizza complete with an Ancestral Blend crust of 10 grains, including oats, brown rice, buckwheat, quinoa, amaranth, teff, spelt, tapioca and two kinds of wheat. Whew! That ingredient list may seem like a mouthful, but trust me, this girl’s mouth was more than happy to be full of it. 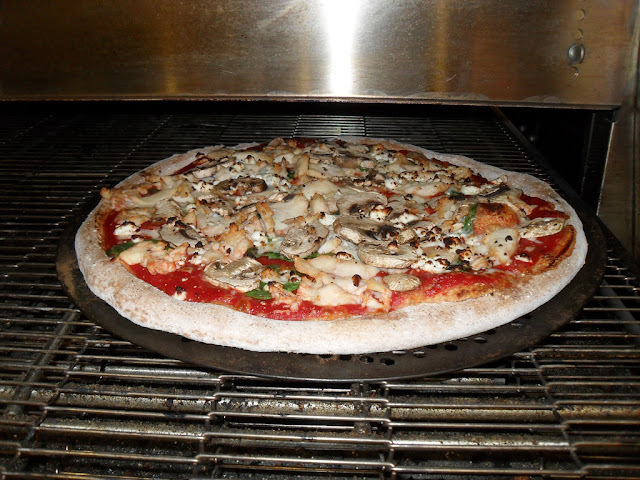 Naked Pizza offers their original Ancestral Blend crust, their skinny Ancestral Blend crust (the original pounded out into almost a crackery, flatbread consistency) and their just-as-good-as-the-real-deal gluten free crust. 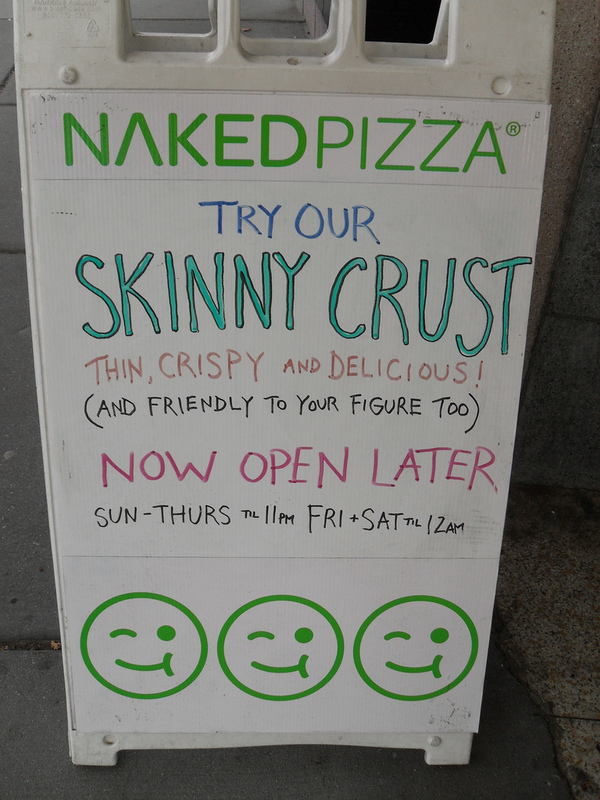 I made sure to try both the original and the skinny, knowing very well that I could remain skinny and continue looking good naked (if I do say so myself) after housing two of Naked Pizza’s lower-calorie-by-comparison creations. Peter kindly let me make my Naked Pizza’s a little less naked that evening, allowing me to put on an apron and assert myself on the toppings assembly line. 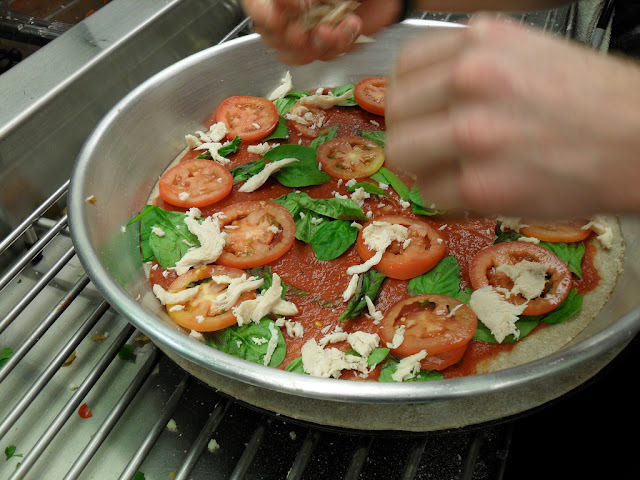 I decided that I’d go super skinny for my skinny crust pizza, opting for no cheese and only their rich and herb-laced sauce, fresh torn basil leaves, juicy white meat chicken and slices of fresh tomato. After a less than five minute trip through their evenly-heated ovens, I was biting into a pizza that definitely tasted healthy, but also definitely tasted delicious. Basically, since I wasn’t expecting the Meat Lovers Heart Attack with Cheese, I was super satisfied with this light and healthy thin crust creation. For the original crust, I went for sauce, mozzarella, bits of roasted garlic, spinach, mushrooms and chicken, and I was pretty pleased with myself upon consumption. The crust was so nutty, so hearty, so grainy, so textured. It was uniquely satisfying, likely since I felt good about it mentally, physically, emotionally, socially, holistically, spiritually and however else one is able to feel good about something amazing. Now, Naked Pizza may not curb your “It’s 2am on a Saturday night and all I need is a pizza to keep me from gauging the eyes out of whoever gets in my way of said pizza” cravings. However, like all healthy food, there is a place for Naked Pizza in your week. 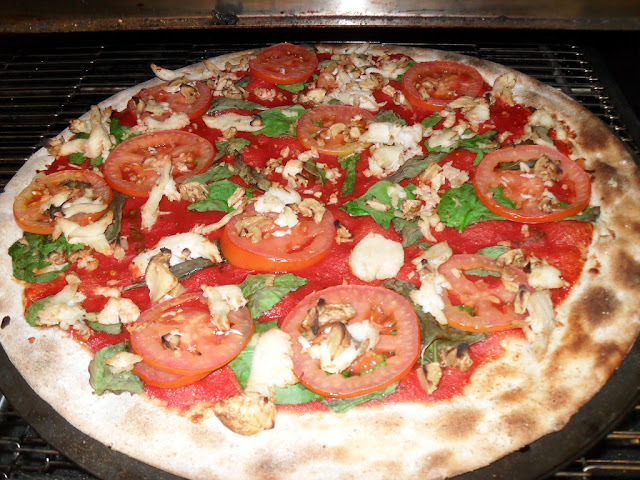 It tastes good – there’s no denying that, so there’s no need nor sense to deny your taste buds and your body Naked Pizza’s healthy spin on a classic.